The new Ford EcoSport Hatchback has a lot going for it on paper. It’s big and beefy, but is based on the tiny Ford Fiesta means it’s easy to drive. Its SUV-derived looks, meanwhile, suggest strong practicality and robustness. Even better, according to Ford, it’s super affordable to run. However, you don’t drive paper cars. In the real world, how does it measure up? OSV takes a closer look at our 2017 Ford EcoSport Hatchback review. 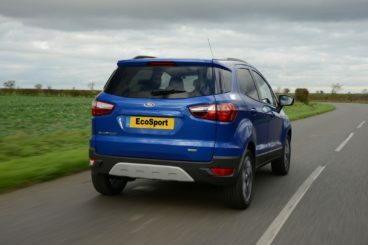 Standards are high in the sector that the EcoSport operates in. In terms of drivability, Ford has fallen short for once. It just doesn’t drive like a Ford. The grip is reasonable, but since it’s based on the perky Fiesta, we expected so much more from it. We expected scalpel-sharp handling and a bit of entertainment. It has neither. In fact, its driving dynamics are dull. It’s taller than the Fiesta, and as such it does lean in corners. The ride is on the firm side, and it doesn’t soak up lumps and bumps at all well. To get lower, softer suspension, you’d have to fork out for the range-topping Titanium S model. In terms of its engines, we like the 1.5-litre 93bhp diesel engine. It offers a good blend of performance and economy, and can pull you from rest to 62 in 14.0 seconds. Because it’s got more pulling power lower down than any petrol engine, it feels nippy. The petrols have got the ace in the park, though, in the form of the award-winning 1.0-litre EcoBoost. It delivers up to 123bhp, and can get you from 0 to 62mph in 12.7 seconds. A 138bhp version is also available, but it’s honestly not much faster. At least not enough to justify the extra cash. It’s also only available with the range-topping model. A 1.5-litre petrol engine is cheaper than them both, but it lacks power and does 0-62 in 13.3 seconds. The EcoBoost is without a doubt the liveliest engine. It goes some way to giving the EcoBoost a kiss of life. If you don’t mind the higher running costs, it might be worth a punt over the diesel engine. Ford have discarded their usual entry-level model, and the EcoSport opens with the Zetec. This means the cheapest model is a tad on the expensive side, but it also means standard kit is good. The Zetec trim gets air conditioning, 16” alloys and LED signature lighting. Move up to the Titanium trim, and you get keyless entry, 17” alloys, and partial leather seats. You also get climate and cruise control. The Titanium S model tops the range off. It’s the only model you can get with the 138bhp petrol engine, and comes with gloss black alloys. It also adds gloss black mirrors and roof, as well as a Sony DAB radio. In terms of the car’s safety, it scored only 4/5 when it was crash tested by Euro NCAP. This is a slight cause for alarm, as most modern cars bag all 5 stars. However, Euro NCAP’s standards are now super high. The EcoSport scored well for adult occupant protection, but less well for safety assistance. Prices for the new car start out from £15,400 and rise to £18,900. For more information on our leasing deals, check out our page here. In terms of its running costs, the EcoSport on the whole can’t compete with rivals. The 1.5-litre 93bhp diesel engine is the most frugal of the range, and can return 64.2mpg. No engines are exempt from tax, with this diesel costing £30 a year to keep on the road. The EcoBoost petrol engines might be modern as heck, but they can’t compete with rivals when it comes to efficiency. The 1.0-litre 123bhp is the cheapest to run, and can return 52.3mpg. It’s expensive to tax, too, and will cost £110 a year. The 1.0-litre EcoBoost unit that powers the range-topping model returns the same numbers. You get to choose from a good group of engines, from state-of-the-art EcoBoost petrols to workhorse diesels. Prices start out from just £15,400, which is hugely appealing in this market. Because the Zetec opens the range, standard kit is excellent. 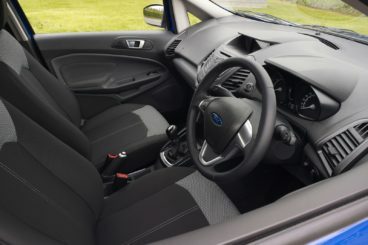 The interior is essentially lifted from the Fiesta. But while the Fiesta looks great on the outside, it’s looking dated indoors. Are you gonna be the one who ends up with a Ford that – for once – isn’t much fun? The offbeat Nissan Juke still looks the same as last time. But thanks to such unique styling, that means it doesn’t look dated. However, its interior hasn’t changed much either and is starting to show its age. The Juke is usually described as “perky” by motor journalists. Buyers would probably beg to differ. Despite responsive steering and lively engines, it’s not a fun car to drive. It’s comfortable to a degree, but once you hit a pothole, you’ll know about it. Worse still, it’s noisy. Handling is decent, and body roll is well managed. The steering is overly light, though, which means you always feel disconnected from the driving experience. In terms of the engines, an entry-level 1.6-litre 93bhp kicks things off. It’s underpowered, and even if you opt for the automatic transmission which adds a further 19bhp, it still feels that underpowered. The 187bhp 1.6-litre turbo is the liveliest petrol engine. It’s more economical than the entry-level model, and can do 0-62 in just 8.0 seconds. There is only one diesel engine available, a 1.5-litre dCi. We like it – performance is solid. It gets you from rest to 62 in 11.2 seconds and has good acceleration. It won’t set your pulse racing, but it suits the cars quirky nature. In terms of running costs, the Juke falls behind rivals by not offering any tax-free engines. Still, the sole diesel can return 70mpg and costs just £20 a year to tax. The petrol engines aren’t too bad. But the best they can offer is the 50mpg returned by a 1.2-litre turbocharged engine. Nissan updated the interior in 2014. But while they made the boot bigger, they didn’t tweak much else. As a result, the materials are starting to look flimsy and dated. It’s such a shame, too, because this is a funky interior that caught the eye a few years back. There is plenty of colour, but it’s fast become old hat. It’s like an old tribute act in Vegas that’s no longer relevant. Worse still, scratchy, hard plastics are everywhere. And despite looking beefy from the outside, this is a family car that your kids will soon outgrow. It’s aimed at young families, but young families don’t always stay so young so long. The back seats are too small, and the roofline is too low. Still, the boot has been extended to 354-litres – if you stick to the two-wheel-drive model. Go for the four-wheel-drive version and you get 251-litres of boot space. Hmm. 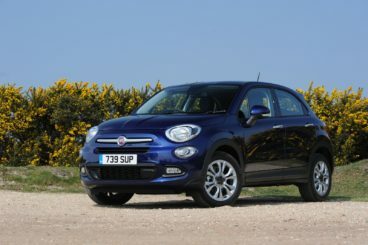 The new Fiat 500X sports a friendly but stylish face. It’s got chunky, SUV-lite looks, handles well, and is a bundle of fun. This is a fairly high-riding crossover. Despite its height, it handles almost as well as the 500 City Car. Body lean is well controlled in bends, and the steering is razor sharp. Refinement on the motorway, meanwhile, is pleasingly good. However, you might be tempted to go for the bigger alloys to beef it up a bit. Doing so will harm the ride quality. Just a friendly warning. We like the turbocharged 1.4-litre MultiAir 140bhp petrol engine. If you’re a low mileage driver, it’s a solid prospect. Acceleration is lively, and the handling is – dare we say it – sporty! Go for the four-wheel-drive 170bhp variant and you’ll end up with significantly higher running costs. There are plenty of diesel engines to choose from, including a strong 2.0-litre MultiJet. It develops 140bhp, and copes with the 500X on a full load with ease. It’s not available across the range, though – unlike the genial 1.6-litre diesel. This one is cheap to run and lots of fun. It can return 68.9mpg economy, and costs just £20 a year to tax. Don’t let those numbers fool you, though, because running costs are not excellent across the board. Stick to the two-wheel-drive models, though, and you can keep costs relatively low. Moreover, the turbochargers help the petrols, and the 1.4-litre MultiAir can return 47mpg. Step inside the car and you’ll be greeted by plenty of retro touches. It’s a stylish, comfy and spacious cabin that suits modern, trendy buyers. The dash has hints of colour but not too many to become vulgar. A 6.5” colour touchscreen is handy and easy to use. And the build quality is good, with the textured materials looking like they’ll last. It’s worth bearing in mind that there are bigger cars in the 500 range than this one. The 500X is a compact SUV that can cater for growing families. If you want more space for adults, it’s worth looking elsewhere. The boot measures 350-litres, which is reasonable. It’s bigger than the Ford’s, but smaller than the Nissan’s. You can extend it to 1,000-litres by folding the rear seats. The boot floor is adjustable, and a wide opening makes access easy. Overall, adults front and back should have enough room to get comfortable – unless you’re over 6 feet. Kids, meanwhile, will have plenty of space to stretch out and shouldn’t do much complaining on longer journeys! It’s actually really hard to make a hugely compelling case for a Ford for once. The brand has failed to bless it with the lively driving dynamics we expect from their cars, while its cabin is uninspired. It’s just not much fun. Compared to better compact SUV’s, it’s not managed to resolve the styling problem. However, it’s got the affordability factor we love Ford’s for. 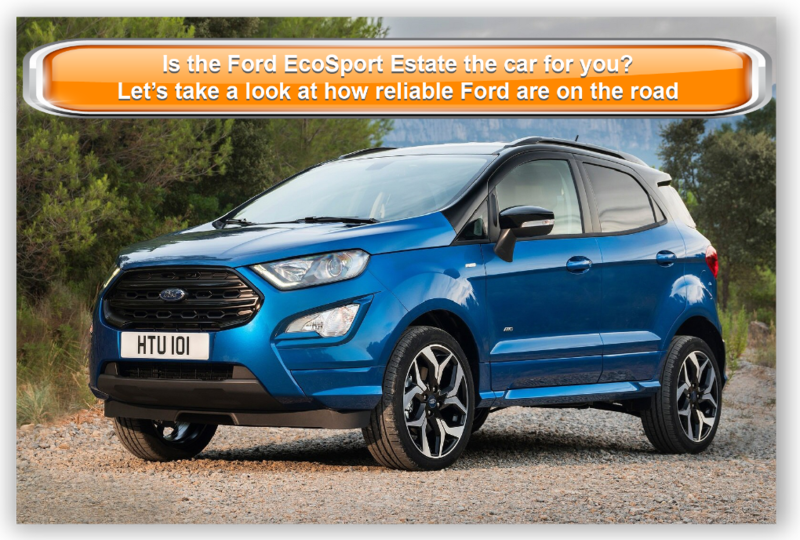 The Ford EcoSport Hatchback is also safe, reliable, well-equipped, practical and has good engines. Worth a test at least.